Everyone's favorite snack emporium is pulling the product from their shelves. Warning to all snackers—if your bag of Trader Joe’s Raw Cashews is stamped with “BEST BEFORE 07.17.2016TF4,” proceed with extreme caution. 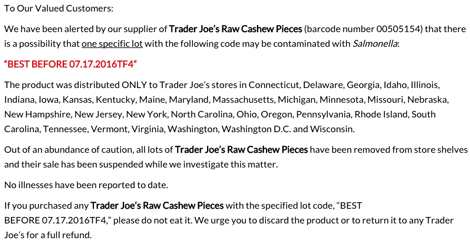 CNN reports that Trader Joe’s has issued a recall of its product—distributed in 31 states—after learning from a supplier that its cashews might carry salmonella. In a recall statement, TJ’s said that they are taking preventative measures by removing the product from their shelves, despite the fact that no illnesses have yet to be reported. FoxNews writes that this isn’t the first time the grocery chain has dealt with a nasty outbreak of bacteria. A year ago, their walnuts had also been flagged for Salmonella contamination. With Chipotle closing its stores nationwide to address a rampant E. coli outbreak, one cannot help but second-guess food safety thus far in 2016.